Pacific Northwest Eye Associates partner and board certified ophthalmologist Dr. Niraj Patel, M.D, FACS was recently honored as a Seattle Magazine’s Top Doctor 2017 for his ninth year. 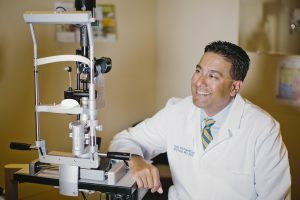 Often regarded as a “doctor’s doctor,” Dr. Patel is a fellowship-trained cornea surgeon with more than 15 years of experience in ophthalmology. He is renowned for his expertise in cataract, cornea and vision correction surgery. In addition, Dr. Patel is the first surgeon in Western Washington to receive certification for the Visian Implantable Contact Lens (ICL). Dr. Patel has established an excellent reputation for his knowledge and passion for eye care. He routinely has patients travel from all over the Northwest to seek his expertise on complex eye conditions. Dr. Patel is a part of a team of doctors, nurses and technicians at Pacific Northwest Eye Associates who deliver outstanding care to residents in South Sound and beyond. Dr. Patel joins the ranks of seven other ophthalmologists awarded this top recognition in the Puget Sound region.